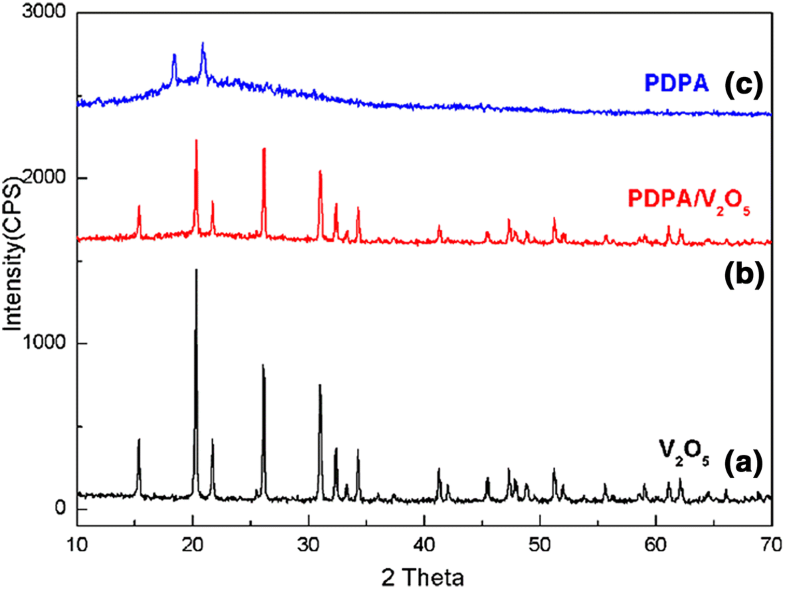 A facile, one-pot oxidative polymerization approach was used to synthesize polydiphenylamine (PDPA) and polydiphenylamine/vanadium pentoxide (PDPA/V2O5) composite using APS as an oxidizing agent. The reactions were carried out in two different reaction media (i.e. aqueous and acidic). The influence of these two mediums on molecular structure, morphology and thermal stability was investigated using FTIR spectroscopy, X-ray diffraction, SEM–EDS and thermogravimetric analysis. The temperature dependent electrical conductivity and dielectric properties (dielectric loss and dielectric constant) of these materials were also conducted. These studies revealed that in aqueous medium PDPA/V2O5 composite has formed however, in acidic medium only the PDPA polymer formed, suggesting different nature of V2O5 in these two medium. The results also showed that the PDPA/V2O5 composite has higher yield, good electrical conductivity, charge transport, dielectric losses and thermal properties as compared to that of PDPA. Furthermore, the electrochemical properties were evaluated by cyclic voltammetry, and electrochemical impedance spectroscopy and found that PDPA/V2O5 composite shows good electrochemical properties. 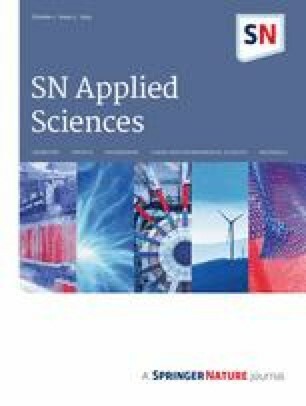 Continuous efforts for the development of strategic materials with controlled structure and property relationship have suggested a new direction for the formulation of polymer–metal oxide composites, with versatile properties. These polymer–metal oxide composites have wide applications in the field of energy storage, solar cell, batteries and supercapacitors [1, 2, 3]. These materials came to the new track, especially after the discovery of conducting polymers (CPs). CPs possess unique optical property, high electrical conductivity, good thermal and environmental stabilities, and inherent microporosity . CP have versatile applications in the field of supercapacitors, batteries, solar cells, corrosion guards etc. [5, 6, 7]. However, it has been observed that CPs alone have failed to provide high conductivity and value added properties. Thus, to overcome these drawbacks researchers have moved towards the synthesis of their copolymers and composites by incorporating metal oxide into the CP matrix. Various metal oxides such as nickel oxide, cobalt oxide, manganese oxide, copper oxide vanadium oxide etc., have intensively been used due to their availability, chemically stability, mechanically, eco-friendly, and high performances in supercapacitor application [8, 9]. On this account, the introduction of transition metal oxide in CPs has gained more attention, which shows good expandability, chemical resistance and cation exchange ability [10, 11]. Among these, the introduction of V2O5 in CPs has attained a great deal of attention due to their various promising properties including their interesting charge transport characteristics, that make them suitable for various applications [12, 13]. The interaction between CP and V2O5 influences the polymer conformation, chain length, and electron transport properties . Moreover, the synergistic effects of V2O5 and CPs generate the electron transport between the CP and V2O5, which ultimately led to the development of new properties. Literature reveals that several groups have reported the composite of V2O5 with different CPs like polypyrrole, polyaniline, polythiophene and their derivatives. However, the Polyaniline (PANI) and its derivatives (alkyl or aryl substituted) have extensively been studied because of their good solubility and ease of synthesis . Amongst these, Polydiphenylamine (PDPA), an N-substituted derivative of PANI, consisting intermediate properties of polyaniline and poly (phenylene) have emerged as a new conducting polymer . Several reports have been published for the chemical and electrochemical synthesis of PDPA and PDPA composite [16, 17]. It has been noted that the synthesis and morphology of CPs and CP based composites are strongly affected by the selection of different catalysts and the reaction media used . For instance, Tao et al. have reported the synthesis of aniline oligomers in alkaline solution, which was further used as a seed to grow the PANI nanofibers in acidic solution. Further, they have reported that the synthesis is low cost environment friendly. Further, in a study reported by Katarzyna et al. , the effect of reaction medium (m-cresol, DMSO, and NMP) on conductivity and morphology of PANI doped with camphorsulphonic acid. 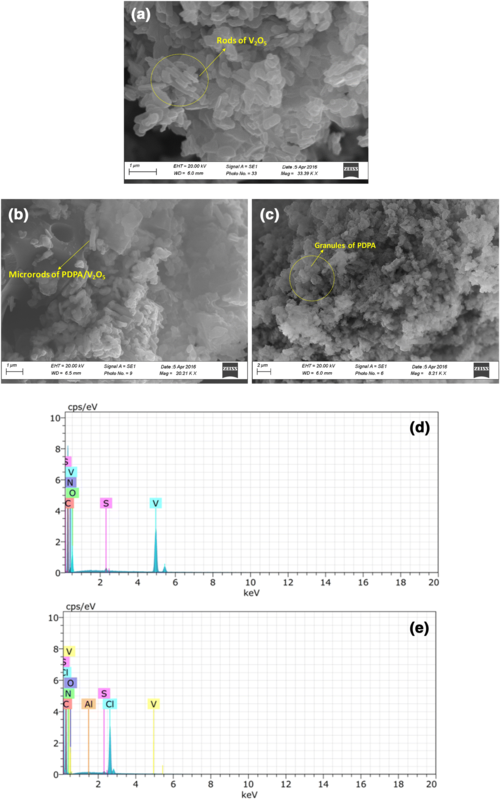 They have inferred that the composite synthesized in presence of m-cresol, exhibited good conductivity and uniform and continuous polymer films. While the composite with DMSO and NMP, showed non-uniform and granular films with lower conductivity. To the best of our knowledge, no work has been reported till date on the influence of reaction medium (aqueous and acidic) in the processing of PDPA and PDPA/V2O5 composite. Interestingly V2O5, in these reaction mediums is able to alter the bulk properties of PDPA and PDPA/V2O5 composite. On this account, here we report one pot facile synthesis of polydiphenylamine/V2O5 composite in two different media i.e. aqueous (H2O) and acidic (HCl). The influence of these media on their structural, morphological, thermal and electrical behaviour was investigated. It was found that in aqueous medium PDPA/V2O5 composite has formed, which exhibited better thermal and electrical properties than PDPA polymer that synthesized in acidic medium. Diphenylamine (DPA) monomer (C12H11N, mol. wt. 169.22) Merck Germany, Vanadium pentoxide (V2O5, mol. wt. 181.88) Thomas baker chemicals, Ammonium peroxydisulphate (APS, mol. wt. 228) Alfa Aesar, hydrochloric acid (HCl, mol. wt. 36.46, %assay 36.5, sp. gravity 1.18) Merck India and distilled water. PDPA/V2O5 was synthesized according to our previously reported work . However, to investigate the effect of medium, the same was synthesized in acidic medium. In the process, 0.507 g (0.01 mol) fine powder of vanadium pentoxide (V2O5) was dissolved in 50 mL of 1 M HCl and taken in a round bottom flask fitted with thermometer, ice bath and magnetic stirrer. 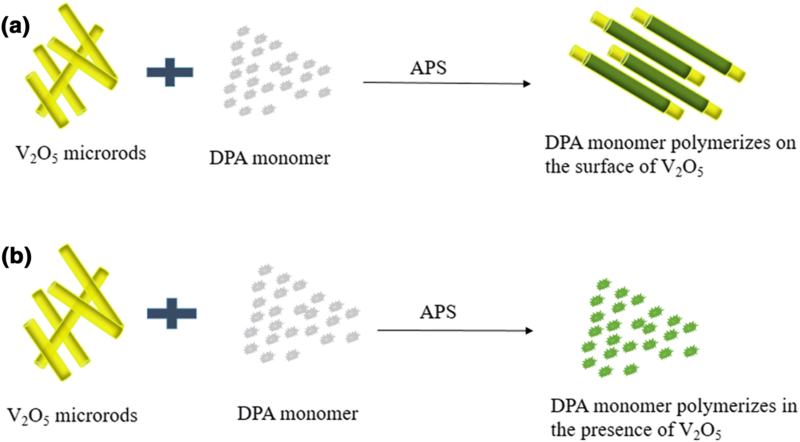 Further, the addition of 1.69 g (0.01 mol) of DPA monomer was carried out that provides pre-oxidative polymerization of DPA, which was established by the change in colour from yellow to light green. After this, 50 mL of 0.01 m APS aqueous solution was added dropwise that further changes the colour from light to dark green indicating that APS promotes the oxidising ability of V2O5 in HCl medium. The reaction was further proceed for 24 h. After the completion of reaction, precipitate of was filtered, washed and dried at 80 °C for 24 h in oven. This indicates that the presence of V2O5 alone does not contribute to the polymerization of DPA, as no change in colour was observed. This behaviour suggest that the V2O5 does not participate in the oxidation of DPA monomer for its polymerization. However, V2O5 gets enveloped by PDPA and formed PDPA/V2O5 composite. The reaction was further allowed to proceed for 24 h. After the completion of reaction, the precipitate of PDPA/V2O5 composite was filtered, washed with distilled water and methanol repeatedly until the filtrate become colourless. The collected composite was dried at room temperature (37 °C) followed by further drying at 80 °C for 24 h in oven. The structural characterization of the PDPA polymer and PDPA/V2O5 composite was carried out with the help of Fourier Transform Infrared (FTIR) spectra (Shimadzu FT-IR spectrometer) using KBr pellets. The advance X-ray diffractometer (Rigaku Rodaflex 200B) was used to record the X-ray diffraction (XRD) patterns at the 2θ range of 10°–70° using Cu Kα radiation. The morphology and elemental analysis were characterized by SEM and EDS analysis using EVO18, Carl Zeiss, Germany equipped with EDS detector. The electrical properties of PDPA/V2O5 composite and PDPA were characterized by temperature dependent DC conductivity meter in the temperature range 364–463 K. For measuring the DC conductivity, the pellets of the synthesized composites were used. A constant voltage of 1.5 V was applied across the pellets and measured the current. The temperature was measured with the help of copper-constantan thermo couple, which was kept between the two steel electrodes. The electrochemical property of polymer and polymer composite was studied by cyclic voltammetry, measured by Autolab type III potentiostat (μ3AVT70762 Netherland). The measurement was carried out in 0.5 M H2SO4 aqueous solution on a standard three-electrode system using platinum wire as a counter electrode and Ag/AgCl (saturated KCl) as the reference electrode, respectively. The CV curves were recorded in the potential window from + 1.2 to − 1.2 V (vs. Ag/AgCl) at scan rate of 2 mV/s. Electrochemical cyclic stability of the electrodes were also carried out by CV over 200 cycles. The electrochemical impedance measurements were carried out in a frequency range of 10 Hz–100 MHz using Wayne Kerr 6500B instrument. V2O5 behaves differently in aqueous and acidic medium. In aqueous medium, the conversion of DPA into PDPA/V2O5 composite was initiated after the addition of APS, which can be said by observing the change in colour from yellow to green. This indicates that the presence of V2O5 alone does not contribute to the polymerization of DPA as no change in colour was observed. This behaviour also suggest that the V2O5 does not participate in the oxidation of DPA monomer for its polymerization. However, V2O5 gets enveloped by the PDPA and forms PDPA/V2O5 composite. While in acidic medium the pre-oxidative polymerization of DPA monomer occurs without adding APS, which was established by the change in colour from yellow to light green. The colour of the reaction further changed upon the addition of 1 M HCl/APS solution. Additionally, it was observed by the following characterization techniques that the composites obtained in aqueous reaction medium showed good thermal and electrical properties than the polymer obtained in acidic medium. Schematic representation for the formation of composite and polymer have given in Fig. 1. The FTIR absorbance spectra of PDPA/V2O5 composite and PDPA are given in Fig. 2a, b respectively. The broad and intense absorption band at 3388 cm−1 and 3381 cm−1 in PDPA/V2O5 composite and PDPA corresponds to –NH– stretching. The absorbance band at 1590 cm−1, 1491 cm−1, and 1316 cm−1 are due to C–H stretching in the quinoid, phenyl and benzenoid rings, respectively . A slight shifting of these peaks (i.e. from 1484 and 1310 cm−1 for phenyl hydrogen and benzenoid ring respectively) have occurred in PDPA synthesized in HCl medium as compared to that of PDPA/V2O5. The peaks at 1170 and 1163 cm−1 in PDPA/V2O5 and PDPA, respectively, corresponds to the vibration of N-atom attached to the quinoid ring . The absorption band at 815 cm−1 and 806 cm−1 in PDPA and PDPA/V2O5 corresponds to vibration of the 1,4-disubstitude aromatic ring. The peak at 742 cm−1 in PDPA/V2O5 and 749 cm−1 in PDPA corresponds to the C-H out of plane . An addition peak with high intensity appeared at 1016 cm−1 can be attributed to the σ–π interaction between V2O5 . Moreover, the hydrogen bonding between PDPA and oxygen atoms on the surface of V2O5 in the composites further confirms the enwrapping of V2O5 by PDPA. SEM images of V2O5, PDPA/V2O5 composite and PDPA are depicted in Fig. 3a–c. Figure 3a clearly confirmed the rod like structure of V2O5, while PDPA and PDPA/V2O5 composite exhibited irregular granules (Fig. 3c) and rod (Fig. 3b) like morphology, respectively. The V2O5 particles exhibit random one-dimensional growth in aqueous environment. The porous behaviour of this rod like growth is also visible in case of PDPA/V2O5 composites that develop more homogeneous one-dimensional rod like particle in layered manner. On the other hand, the PDPA processed in acidic medium in presence of V2O5 particles failed to enwrap the inorganic phase of V2O5, which may be due to its complete leaching during the polymerization of DPA resulting in the formation of fully porous structure of PDPA. The morphology changed from rod to fully porous granular structure with the change in reaction medium from aqueous to acidic can be explained by the fact that V2O5 is soluble in acidic medium that make the DPA monomer more hydrophilic, while the insolubility of V2O5 in pure aqueous (H2O) medium provides hydrophobic nature to DPA [25, 26]. Hence, the hydrophilic nature of DPA monomer in 1 M HCl medium reduces the repulsion between the charged hydrophilic groups that destroyed the morphology of V2O5 resulting in irregular granules of PDPA . On the other hand, the hydrophobic DPA monomer in pure aqueous medium possess higher surface tension that led the processing of V2O5 rod template, which can be responsible for the formation of rods like structure of PDPA/V2O5 composite. The energy dispersive X-ray spectra of PDPA/V2O5 (Fig. 3d) and PDPA (Fig. 3e) further confirms the presence of vanadium element in aqueous medium, while in acidic medium it is absent. XRD measurements were conducted to determine the structure of the V2O5, PDPA and PDPA/V2O5 and have shown in Fig. 4a–c. The orthorhombic phase of V2O5 has shown highly crystalline nature. The XRD pattern of PDPA (Fig. 4c) shows a diffraction pattern exhibiting the characteristics peaks of PDPA at 18° and 21° , and no other peaks of V2O5 revealing that the V2O5 in HCl medium does not induce its properties and act only as a catalyst just to enhance the polymerization reaction during the formation of PDPA polymer. On the other hand, XRD pattern of V2O5 and PDPA/V2O5 composite, as shown in our earlier work, exhibited the characteristic peaks of V2O5 with low intensity and without any characteristic shift was observed . The decreased intensity with no shift in peaks revealed that the structure of V2O5 has not been destroyed and the formation of PDPA has occurred on the surface of V2O5. The thermal stability of PDPA/V2O5 and PDPA respectively, are shown in Fig. 5. The thermogram revealed that initially PDPA/V2O5 losses 18 wt% in the range of 123–220 °C, while PDPA shows 8 wt% loss at 180–260 °C. More weight loss in case of PDPA/V2O5 in this range may be due to the combined loss of weakly bound interlamellar water and tightly bound intralamellar water [12, 28, 29]. Beyond 260 °C the PDPA exhibit a steep decomposition pattern up to 402 °C, while PDPA/V2O5 shows a second sluggish decomposition in the temperature range of 220–460 °C. This can be attributed to the loss of low molecular weight oligomers . Beyond this, both the PDPA and PDPA/V2O5 composite undergo a continuous degradation up to 850 °C, owing to the degradation of main polymer chain . It is further noticed here that after 402 °C the PDPA follow a sluggish decomposition pattern while PDPA/V2O5 shows a sharp decomposition with less weight loss. It is important to mention here that both the PDPA/V2O5 and PDPA behave differently at low and high temperature. 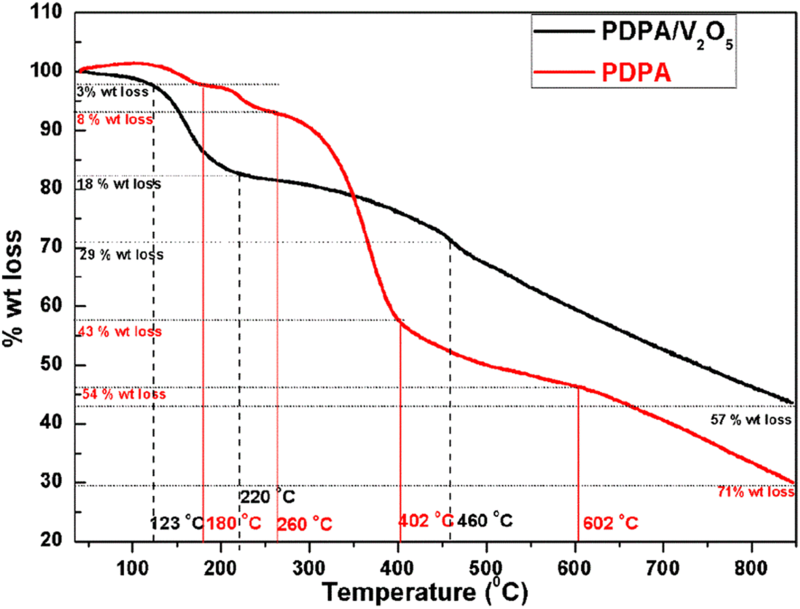 At low temperature (up to 260 °C) PDPA is more stable than PDPA/V2O5 while at higher temperature (above 360 °C) PDPA/V2O5 is more stable. The reason for low stability of PDPA/V2O5 at low temperature is due to the removal of trapped water. The result also suggest that the wrapping of PDPA over the surface of V2O5 rods forms a sandwich like structure which leads to higher thermal stability at higher temperature. The temperature dependent DC conductivity was measured in the temperature range of 364–463 K using constant voltage of 1.5 V, which is shown in Fig. 6. The dc conductivity of both PDPA and PDPA/V2O5 composite increased with the increasing temperature, this can be attributed to the increase in thermal vibration activity that led to the formation of polaron and bipolaron along the conjugated chains of the polymers. Thus, the mobility of charge carriers (polarons and bipolarons) increases with the increase in temperature that led to the increase in the electrical conductivity . It is worth to note here, that the temperature dependent dc conductivity of the PDPA/V2O5 composite is 2 fold higher than that of PDPA (Fig. 6). 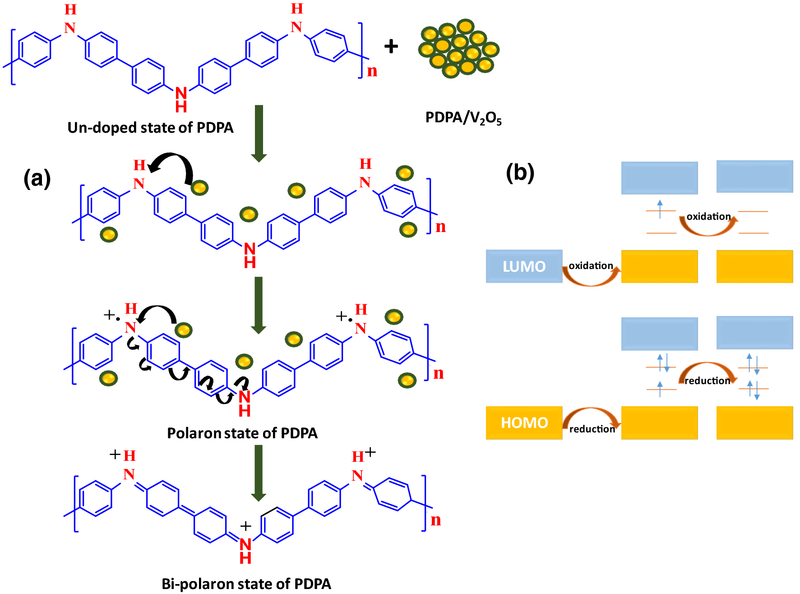 This can be due to the stability associated with the wrapping of V2O5 with PDPA matrix in aqueous medium, which results in the formation of more polaron and bipolaron that led to the enhancement of conductivity. Moreover, In case of composite (PDPA/V2O5), the formation of VO2+ occurs with the increase in temperature, which further helps in the transfer of electrons within the composite that also causes an increase in conductivity [32, 33]. A proposed conduction mechanism in PDPA/V2O5 composite is depicted in Fig. 7a, which showed that with the increase in temperature electron mobility (polarons and bipolarons) increases within the composite as a result transfer of electron is observed i.e. from HOMO to LUMO (shown in Fig. 7b), which lead to the increase in conductivity. The dielectric behaviour of PDPA and PDPA/V2O5 composite were analysed using an impedance analyser in the frequency range of 100 Hz–1 MHz and are shown in Fig 8. The dielectric constant and dielectric loss were found to decrease with the increase in frequency due to dielectric dispersion as a result of the polarization of molecules during the alternation of the electric field at higher frequency, which is in well agreement with the Maxwell–Wagner interfacial polarization and Koop’s model [34, 35]. It was observed that the PDPA/V2O5 composite formed in aqueous medium showed superior dielectric properties as compared to that of PDPA, which is formed in acidic medium. At low frequency (100 Hz), the dielectric constant values of PDPA and PDPA/V2O5 composite was 214.39 and 245.32 while at high frequency (1 MHz) the dielectric constant of the same was found to be 99.17 and 166.47, respectively. On the other hand, the dielectric loss (tan δ) of PDPA and PDPA/V2O5 composite was found to be 0.86/0.21 at low frequency (1 kHz) and 0.17/0.09 at high frequency (1 MHz), respectively. Further, the PDPA/V2O5 composite exhibited much lower dielectric loss than that of PDPA, which suggest that PDPA/V2O5 composite synthesized in aqueous medium exhibits better dielectric properties than that of PDPA and may find a potential application in the field of capacitors, and battery. 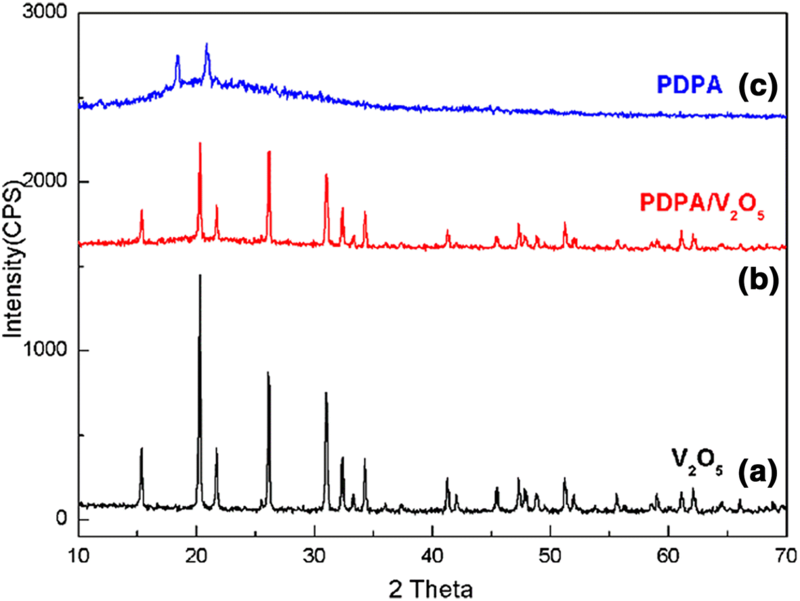 To study the influence of medium on electrochemical activities of PDPA/V2O5 composite and PDPA polymer, the cyclic voltammetry were carried out in 0.5 M H2SO4 aqueous electrolyte at the scan rate of 2 mV/s in the potential range + 1.2 to − 1.2 V versus Ag/Ag+. The cyclic voltammograms (CV) of PDPA/V2O5 composite and PDPA polymer have shown in Fig. 9a. It is observed that the oxidation and reduction potentials were found to be different for PDPA/V2O5 and PDPA. PDPA/V2O5 exhibit single anodic (anodic) and cathodic (reduction) peaks at 1.02 V and 0.50 V, respectively. While the PDPA shows, single anodic (oxidation) peaks at 0.87 V and double cathodic (reduction) peaks at 0.68 V and − 0.62 V, respectively. On one hand, PDPA/V2O5 exhibits broader peak within the range of positive potential, on the other hand, PDPA shows the broader peak in negative potential range. Another distinguished feature is that the oxidative current density peak of PDPA/V2O5 composite is higher than that of PDPA. This can be attributed to the charge transfer at the electrode–electrolyte interface in PDPA/V2O5 composite is faster than that of PDPA. The CV curve of the PDPA/V2O5 shows slightly larger area than that of PDPA indicating that PDPA/V2O5 can exhibit a better capacitive behaviour . The electrochemical properties (capacitance and resistance) of PDPA and PDPA/V2O5 composites were further examined with the help of EIS measurement. The imaginary impedance (Z’’) versus real impedance (Z’) is a Nyquist plot (Fig. 9b) of the same was recorded. The curves exhibit a semicircle at high and low frequency region, which corresponds to the charge transfer reaction at electrode/electrolyte interface [37, 38]. The PDPA/V2O5 composite displayed a semicircle with smaller diameter than that of PDPA. This indicates that the PDPA/V2O5 composite exhibits low impedance on electrode–electrolyte interface . An inset shows a simple equivalent circuit model used to simulate the impedance spectra of these composites. In this circuit, Rg, Rgb and Rel are the grain, grain boundaries and electrode resistances whereas, Cg, Cgb and Cel represent the grain, grain boundaries and electrode capacitances while Rel and Cel represent the electrode resistance and capacitance, respectively. The fitted values for the resistance and capacitance of PDPA/V2O5 composite and PDPA are given in Table 1. The high resistance of grain boundaries (Rgb) in PDPA may be attributed to the presence of defects in the grain boundaries, which trapped the conducting charges. At high frequency, the value of grain capacitance (Cg) and resistance (Rg) was 13.8 nF and 1.2 kΩ for PDPA/V2O5 composite and 14.8 nF and 1.9 kΩ for PDPA. 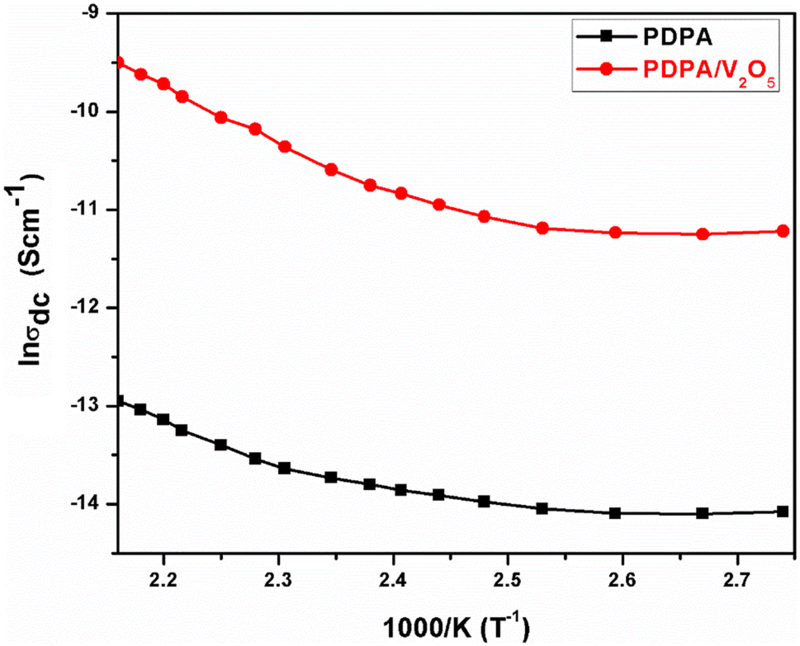 Moreover, the low Rel value (328 MΩ) for PDPA/V2O5 composite as compared to PDPA polymer (880 MΩ) further suggests higher ionic conductivity for PDPA/V2O5 composite than PDPA polymer. This may be attributed to the ease of release of trapped charges in aqueous medium than that of acid medium, which is well in agreement with conductivity measurement . These studies revealed that the reaction medium plays an important role in the synthesis, structure, and morphology of these materials. The reaction medium also affects the thermal, electrical and electrochemical properties of PDPA and PDPA/V2O5, which are summarized in Table 2. In the present study, we have discussed the influence of reaction medium (aqueous and acidic) on the formation of PDPA and PDPA/V2O5 composite for the first time. The synthesis were facile and one pot. The structural, morphological, electrical and thermal properties are tuned just by the changing the reaction medium i.e. acidic to aqueous medium. XRD and EDX analysis revealed that in aqueous medium PDPA/V2O5 composite has formed, while in case of acidic medium only the PDPA polymer is formed, as in acidic medium V2O5 acts only as a catalyst that finally leaches out. Additionally, SEM analysis revealed that the PDPA showed granules while PDPA/V2O5 exhibits rod like morphology. TGA studies revealed that PDPA/V2O5 composite displayed excellent thermal properties (i.e. char residue of 43% at 850 °C) than PDPA (char residue of 29% at 850 °C). The electrical conductivity at 463 K for PDPA/V2O5 composite was found to be 7.44 × 10−5 S cm−1, which is higher than that of PDPA (2.36 × 10−6 S cm−1). Moreover, PDPA/V2O5 composite exhibited superior dielectric properties (i.e. dielectric constant of 257.32 at 1 kHz), which is much higher than that of PDPA (218.39 at 1 kHz). Thus, these studies revealed that the aqueous medium is suitable for the synthesis of PDPA/V2O5 composite to avail better properties. Thus, it can be concluded that PDPA/V2O5 composite has a potential scope in the field of energy storage devices e.g. capacitor and batteries. One of the author, Halima Khatoon, gratefully acknowledge MANF-UGC (F1-17.1/2014-15) for financial assistance. We further extend our sincere thanks to Dr. Javed Alam, Department of Physics, Jamia Millia Islamia, for temperature dependent dc conductivity measurement.